It’s been about four months since Disney’s Frozen was released in theaters. And I assume that most people have had the chance to see it by now or they have at least heard the song “Let It Go,” gorgeously sung by Idina Menzel. She has such a unique gift to emote through music and I credit her with half the popularity of this song. If you didn’t have much of a reaction to the movie itself, I am guessing you had a strong reaction of some kind to this song. Whether that reaction was “I love this song!” or “Disney has a hidden agenda!,” I bet your reaction was one of strong emotion. If you are like me, you silently cried and you weren’t sure why. I’ve always been an emotional person. I cry when talking about anything too personal, spiritual or uncomfortable. And its ugly crying. The snot dripping out of your nose, voice clutching crying that you can’t stop. 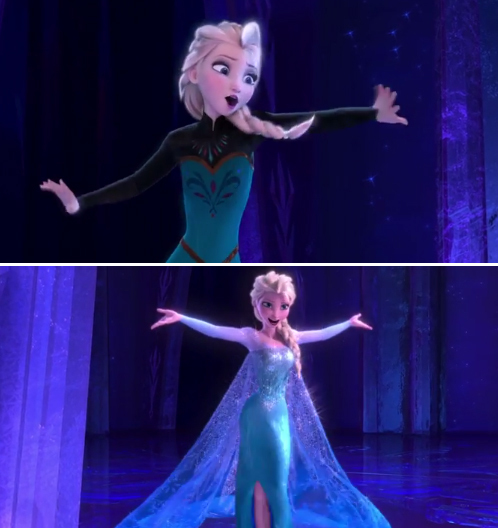 And my whole body shook as I cried in the theater listening to “Let It Go” for the first time in theaters. And I continued to cry the next dozen times I listened to it in my car. Why was I having such an emotional reaction to this song? I have been thinking about this for four months now. And it took me this long to put a name to what I was receiving a release from when listening to this song. It was shame. Specifically shame for having depression. As many of you know, I have battled depression for almost half of my life. And to this day I feel ashamed. That shame is not always from having depression but shame that I can’t just get over it, shame that I can’t be the perfect Wonder Woman my society and culture demands that I should be, with perfectly manicured nails and never breaking a sweat over anything. Shame that I can’t fix it and be done. Shame because my depression has no end. When we feel guilt, we can change our behavior and it goes away. When we feel shame, it isn’t that easy because it is focused on a part of who we are. So even though I manage my depression very well through my behavior, I still feel shame for having it at all. For having to make the effort to deal with it, to never let it out of my sight because it might gang up on me in an alley if I let my guard down for even a second. For me personally this song was about my shame for depression. But the song writers were clever enough to make the song universal. Shame for being fat. Shame for being gay. Shame for being religious. Shame for having an addiction. Shame for being a nerd. Shame for being yourself. And when you decide to accept yourself as worthwhile, the storm of society’s judgement will rage on. Loving yourself is not an easy thing and the world might tell you loving yourself is wrong because you are wrong. But you can outlast the storm if you have love (something else Frozen taught us). I will forever be indebted to Kristen Anderson-Lopez and Bobby Lopez for writing this song. If you haven’t read about them, they are parents to two little girls and wrote Let It Go for them. I began writing this essay just hours before the Oscar’s and I was touched by their acceptance speech for best original song as it confirmed my understanding of this song and what it means to them and hopefully to every little girl who has been singing it on repeat for months now. We live in a world where the expectations are ridiculous and impossible for girls (and women) to achieve; a world that is almost guaranteed to make beautiful, wonderful, unique girls who once loved themselves suddenly feel that they don’t deserve that love from themselves or others anymore. Because they are ashamed of who they are and for not being able to live up to the standards of the world. And if there is one thing I know with absolute certainty it is that everyone in this world deserves love, from themselves and from others. And Frozen did a wonderful job showing that love can mend a broken heart. Don’t let fear or shame stop you from being awesome. Just be you. So to everyone who has criticized this movie and especially this song, stop it. This song has helped me to find greater love for myself than almost any psychology book or therapist ever has. Just let it go. You made me cry. I love you. Aw! Thanks mum. I love you too.